Marsh, John S.. "Mount Edziza Provincial Park". The Canadian Encyclopedia, 04 November 2015, Historica Canada. 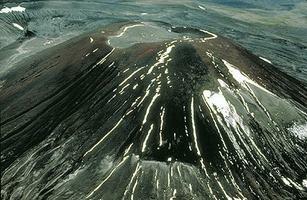 https://www.thecanadianencyclopedia.ca/en/article/mount-edziza-provincial-park. Accessed 21 April 2019. One of the composite and (at present) dormant volcanoes that form a belt from northern BC to the southern Yukon (photo by J.A. Kraulis). Mount Edziza Provincial Park (est 1972, 2300 km2 ha) comprises part of the Tahltan Highlands, between the Stikine and Iskut rivers in BC. The nearest community is Telegraph Creek, 20 km northwest of the park. The area is a volcanic wilderness that, according to Aboriginal legend and scientific research, has been geologically active within the last few hundred years. Some 30 cinder cones dominate the park landscape, the highest of which, Mount Edziza, rises to 2787 m. Around it is a 640 km2 lava plateau. To the south are the older, brilliantly coloured and glacially eroded Spectrum Mountains. The area experiences great temperature variations, and snow may persist on the peaks throughout summer. Wildlife includes mountain goats, stone sheep and, at lower elevations, mountain caribou, grizzly bear and moose. In the late 1800s, a trail was built across the southern part of what is now the park, through Raspberry Pass, to allow construction of a telegraph line that would link North America, Asia and Europe. Abandoned poles and derelict cabins can still be found along this route. All access to this wilderness is by rough trails that require visitors to be experienced and fully self-sufficient.